Many people this week are talking about turkeys. But not in the same way as us here at UC IPM. Wild turkey sightings have gone from being a rare occasion to becoming a common event in recent years, as their populations have exploded in some urban areas of California. These large birds often travel together in flocks, where they cause trouble as they search for food – by scratching and digging in gardens, and leaving their waste behind. 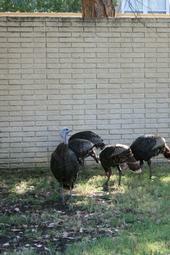 Wild turkeys often pose a traffic hazard as they cross streets or walk in roads. They can also be aggressive and may chase or harass people.